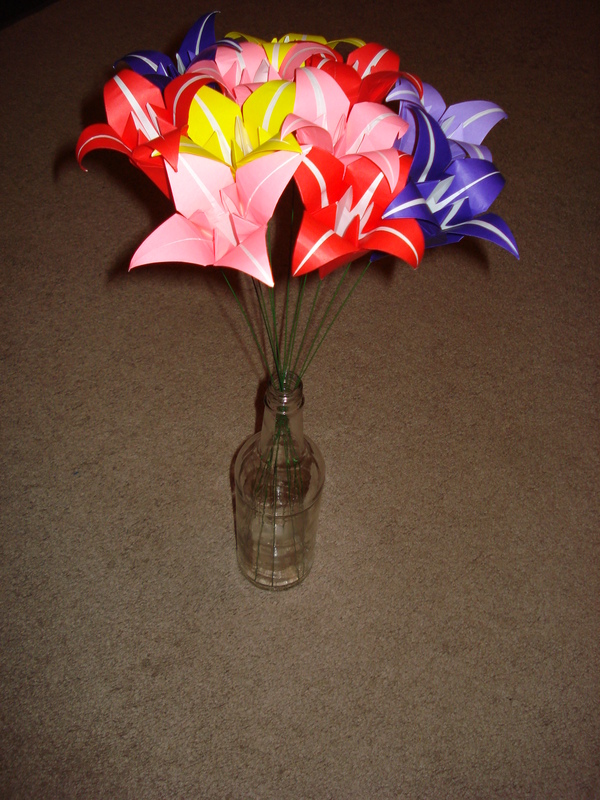 I’ve been crazy busy lately and working on origami lilies like crazy so I can make my bouquet and finish up the centerpieces. I haven’t been posting updates since I’ve been trying to actually accomplish stuff instead of writing about it, but I’ll try to sit down and write updates on my invitations (SENT), my thank you cards that are in the progress of being made, the stringing of the cranes, the guestbook I purchased, and everything else I’ve done that hasn’t made it onto the blog yet. 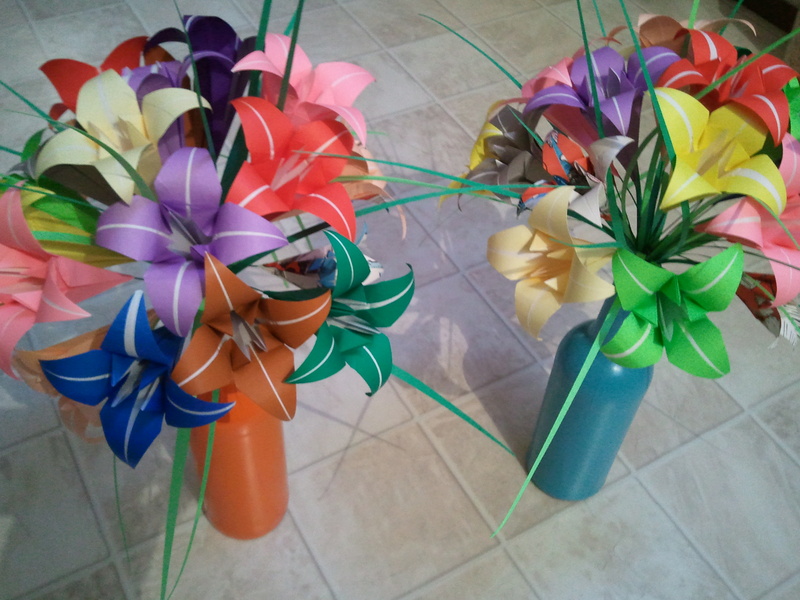 For now, here is a teaser post about my centerpieces. I spray painted most of the bottles (I think I have 10 painted) and have started filling them with flowers. I still have about a bajillion lilies I need to fold and I need to paint a few more bottles, but I’m pretty happy with how they are turning out. One of each colored centerpiece vase. One of the first wedding DIY projects I stumbled upon was the painted wine bottles on ruffled blog. I love everything about these, from the eco-friendliness to the actual colors and the flowers they put in them! There is nothing I don’t love about these and I plan on doing something very similar for my wedding. I’ll be using recycled alcohol bottles (like vodka, rum, etc.) since my mom works at a restaurant with a full bar so she can collect them for me for free. I haven’t decided on the colors yet, but I’ll either go with the full rainbow (red, orange, yellow, blue, green… probably not purple) or just stick with our wedding colors of red, blue/aqua and some orange. I would love to either put bright colored origami-style flowers in them or I’ll purchase some bright flowers from the farmer’s market a couple days before.